I finally visited the dermatologist Dr Valarie Callender at the Callender Laser and Skin Care Institute about 2 weeks ago. I really like Dr Callender. Our appointment was quite short but she was pleasant to talk to. She examined my face and obviously was very familiar with my skin problem. My acne is caused by bacteria under the skin - I was prescribed an oral anti biotic - Adoxa and a RetinA cream - Torazac. She also gave me some samples to start using because of the delays in getting the prescription filled. I also received samples of Ambi fade cream. I'm so glad I got the samples because I still don't have the prescription filled because of pre-authorization issues with the insurance company. Hopefully that should be resolved by next week. I see definite improvements already in my skin, but I won't say too much right now. Let's see what happens when I go through my 'cycle'. Will I have another massive eruption of zits or will things be under control? In addition to frequent breakouts, my skin is blemished. It takes forever for the dark spots om my face to fade and before the batch from last weeks break out get a chance to heal I get another slew of break outs. Marsha, my aesthetician, has advised, warned and begged that I religiously use sunscreen SPF 30 or above everyday without fail. The best skincare regiment designed to fade dark spots will not be very effective if one continues to expose the dark areas to the sun. Sunscreen is a must. As long as there is a sun in the sky, regardless of season - Winter,Spring, Summer or Fall, you gotta use sunscreen. One of my goals for this year is to find a solution to my recurring acne problem. This problem seems to be getting worse every month regardless of what I try. I drink lots of water, exercise and wash my face twice a day. I use a great cleanser, toner and moisturizer. What else is a woman supposed to do to keep from getting break-outs? Acne is caused by bacteria living in the skin and can also be caused by hormonal changes. I suspect my problem is a combination of the two factors. Enter Marsha Jackson, Aesthetician extraordinaire with The Edge on Central Salon and Spa. I visited Marsha at the salon last summer and was impressed with her wealth of knowledge on skincare especially troubled skin like mine. 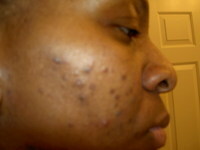 Now Marsha has beautiful skin, so when she told me she had spent most of her life battling acne, I was surprised. It's always good to know you are working with someone who can empathize with your problems. An incident that occurred over the holidays convinced me that I needed to see Marsha again and get some real help for my skin. Marsha took one look at my face during my visit yesterday and concluded that I needed Beta Peel and a more aggressive skincare regiment to really get rid of the acne. A beta peel is a formulation of salicylic acid that that gently exfoliates the dead cells on the surface of the skin, stimulating the skin's natural processes to promote regeneration and renewal of the skin, promoting a more youthful appearance. 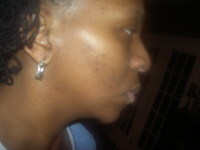 I am on a 16 week program that is guaranteed to bring about some dramatic changes to my skin. In addition to the break outs, I have dark spots or hyper-pigmentation especially on my cheeks. Hyper-pigmentation is a common problem with women of color after an outbreak. I will be taking photos every week so you can keep up with my progress. Embarking on this new skincare regiment is not cheap, but it’s going to be worth it if I get the results I am hoping for.